“We could not be more enthusiastic to make the AACR Philadelphia Marathon the largest run in the United States dedicated to cancer research,” said AACR Foundation Executive Director Mitch Stoller. The Philadelphia Marathon and the American Association for Cancer Research (AACR) announced Tuesday that they have embarked on a new three-year partnership to expand the City’s commitment to improving the health of its citizens. Dedicated to preventing and curing all cancers, the AACR supports activities that encourage the public to lead a healthy lifestyle as research shows this can help reduce the risk of cancer. 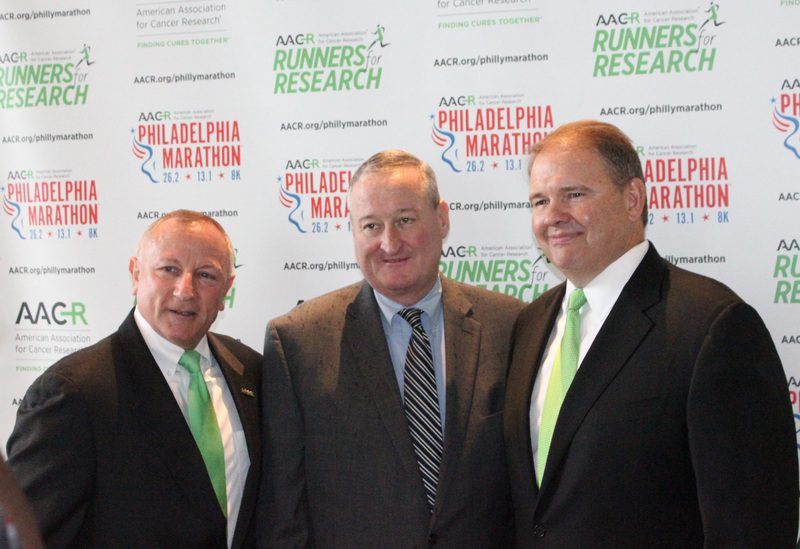 Philadelphia Mayor Jim Kenney addressed those in attendance Tuesday morning at the Independence Visitor Center and lauded the AACR for becoming the Marathon’s new title partner. “I’m extraordinarily proud to partner with an organization that carries such prestige and boasts such an impressive history,” said Mayor Kenney of the AACR and its new partnership with Marathon. This partnership serves to benefit both the City and the AACR. The City gets a partner with roots not just in Philadelphia, but also in running communities across the United States. The AACR Runners for Research team participates in races around the country to raise funds to support its more than 37,000 members who are working to defeat cancer. Together, the Philadelphia Marathon and the AACR can grow the Runners for Research team to raise additional funds for cancer research. This title partner announcement comes with just over three months remaining until race day. Registration is ongoing. Those wishing to register are encouraged to visit http://www.philadelphiamarathon.com.